Get swept off your feet with the spirit of curling and join the Eau Claire Curling Club as they host Learn-to-Curl sessions at 1pm each Saturday Dec. 1-15 at 5530 Fairview Drive. Anyone is welcome, and no prior experience is necessary to participate in the on- and off-ice instructions and games, led by members of the Eau Claire Curling Club. The ECCC is a nonprofit organization with more than 300 participants. 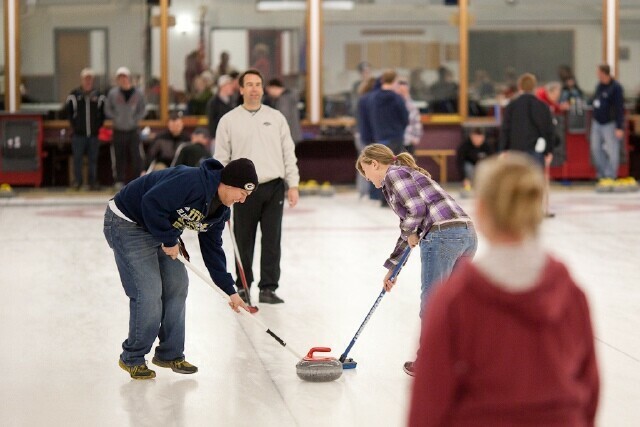 With reasonable fees and multiple leagues, the Eau Claire Curling Club offers experiences for any kind of athlete. No registration is needed to take part in the Learn-to-Curl event. The cost is $10 per person, but it will be free for anyone under 18 as well as college and technical school students. For the optimal experience, wear warm athletic gear and carry in a clean pair of athletic shoes. Soda, water, and beer (for ages 21+) will be available for purchase. To learn more about the Learn-to-Curl event and the Eau Claire Curling Club, visit curlingclub.com.